My sweet little Lucas Michael arrived on February 14th at 5:53 am after a peaceful Hypnobabies birth. My first birth was a non-Hypnobabies birth and far from how easy and peaceful this one was. When I woke on the 13th I suspected I was in early birthing time (Hypnobabies word for labor) since I was pretty crampy along with my low back being sore and achy. 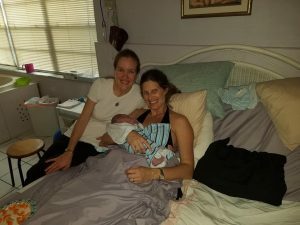 I told my husband, mom and doula so they could gear up if needed. My husband and I took our almost 2 year old for a walk to the beach to play on the playground for a little. 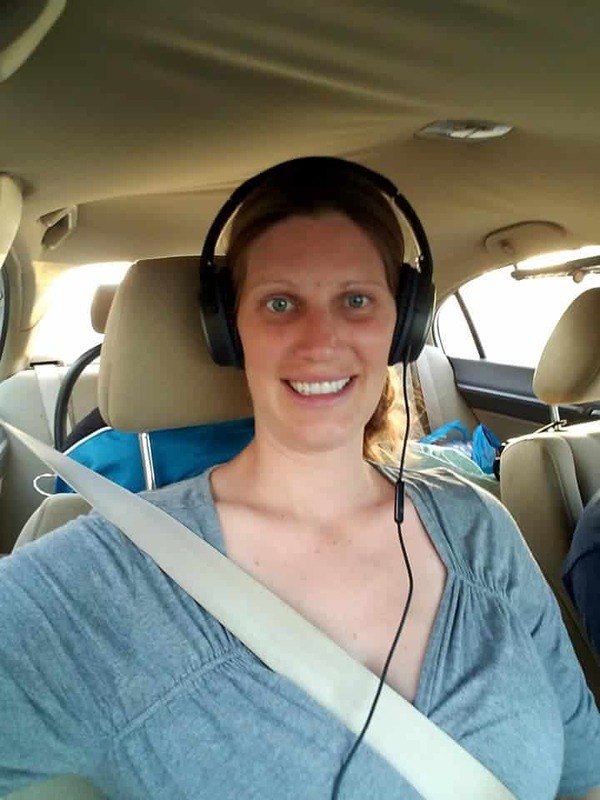 I chatted with some other moms and had intermittent waves but not too regular yet. We can back, ate lunch and I attempted to take a nap. By about 4 pm the waves (Hypnobabies word for contraction) were 15 to 20 mins apart and my husband wanted to head to the birth center since it is an hour and a half away from us. The drive was not fun, but I found peace in listening to my tracks on headphones. When we arrived they checked me and told me to go to the room and try to rest or go get something to eat or whatnot. My husband went and got dinner and my doula, Melanie V. of South Florida Hypnobabies, and I kind of nested in the room and chatted. My husband brought food back and we ate and then all laid down to rest until about midnight. I was listening to my birthing day tracks, like Easy First Stage (Hypnobabies main birthing day tracks) and Birthing Day Affirmations, as well as listening to soft worship music from time to time but every wave I always stopped whatever I was doing and went from my Center switch to Off (Hypnobabies techniques for deepening hypnosis) and then back to Center when the wave was over. Things were peaceful. My doula would give me hypnosis cues like Peace and Relax (Cues for instant physical comfort and to deepen hypnosis) to help during my waves but I really just was at such peace. (Huge credit to Hypnobabies for me not being scared and just rolling with the waves each time.) In between the waves I was chatting and joking with the midwife, doula, and my husband. Things started getting more intense and the distance between my waves became shorter. I spent some time in the tub and then got out to cool off. At one point, at maybe 5:20 or 5:30, my water broke. At this point, with every wave, I could feel my baby moving down. 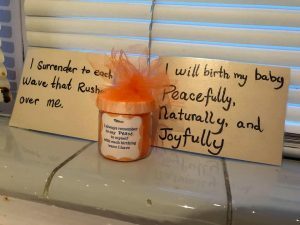 My doula put on my Pushing Baby Out track (Hypnobabies special track just for pushing) and they quickly helped me move to the tub and my body quickly took over. I got comfortable in the tub and put my hand down by my baby. I could feel his head moving down with every wave and my body opening on its own without me even pushing. 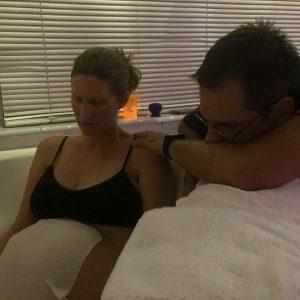 This was amazing to me because I felt like I fought my body during my first son’s birth and this was “pushing” totally involuntary. At one point I even thought, I should try to hold the baby in for a few more waves so I don’t tear. But I didn’t tear anyways. The baby came after being in the tub for about 10 mins. 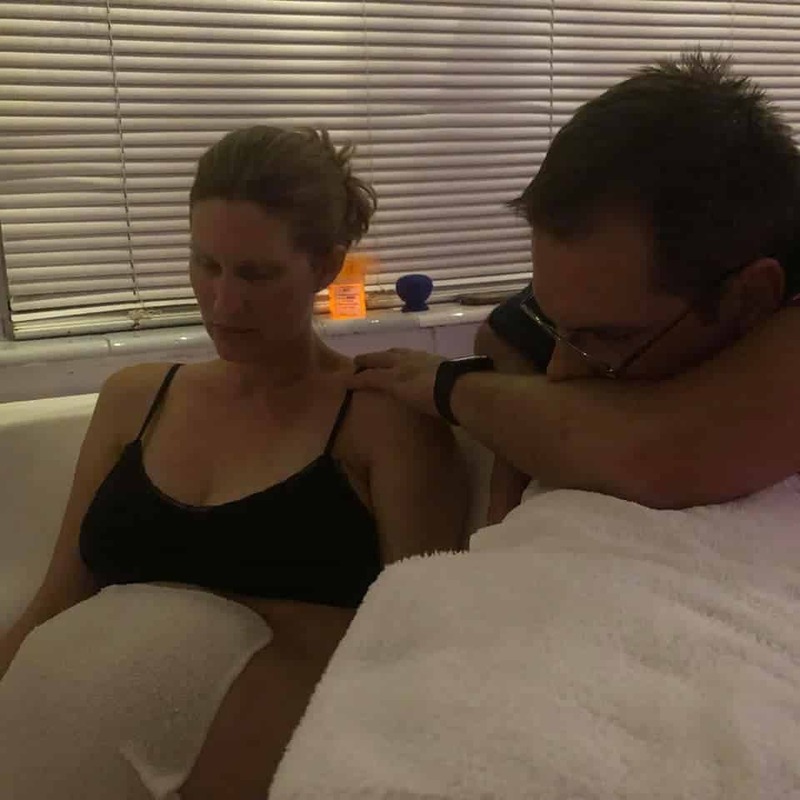 I was able to hold him in my arms and bond with him in the tub before getting out and snuggling him on the bed and enjoying skin to skin time. This was so so so much easier than my first birth. 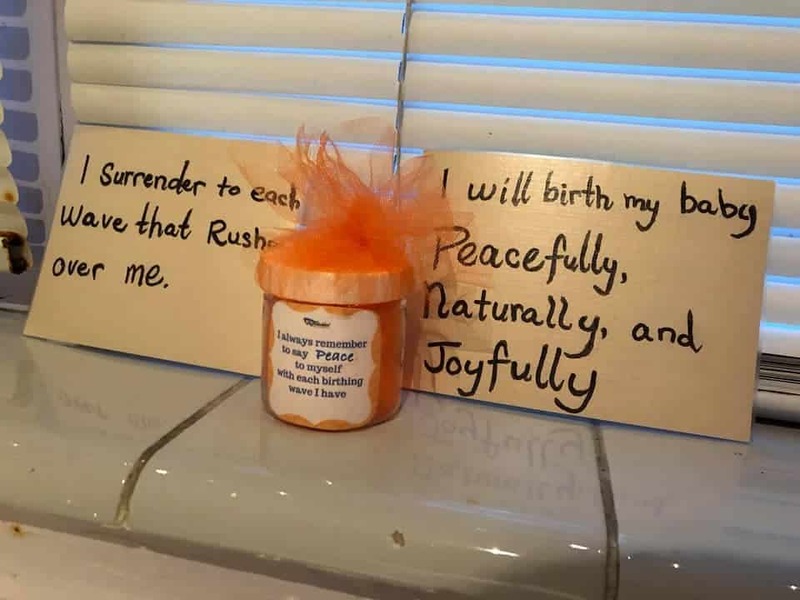 It was truly a “new birth and a new baby” just like my Joyful Pregnancy Affirmations reminded me. 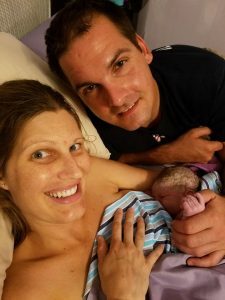 I tell people this is exactly the birth I wanted and after this experience, my husband and I may even have more than 2 kids. My husband told me on the way home that I made this birth look easy! I am so thankful for Hypnobabies and I was honestly the biggest skeptic in the beginning. I thought, well what do I have to lose if I take this class and it doesn’t help. But I have to say by about week 2 or 3 that I was impressed with this course. It prepares you with so much knowledge about birth as well as helps you prepare your mind for what is to come. It works guys! It totally does. I am not a hero or someone who is just tough and can handle natural childbirth. We can all do this and Hypnobabies is a huge help! Don’t fight what your body is made to do, it can be a beautiful experience if you let your body take over and do what it’s meant to do!